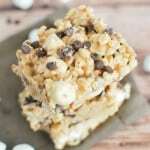 Avalanche Bars – Rice Krispies cereal coated with white chocolate and peanut butter with marshmallows and chocolate chips mixed in! Happy Tuesday! Back to the real world today, huh? That long weekend sure was nice. 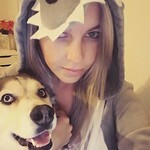 This morning I have to take Penelope (#idiothusky) to the vet for her regular ol’ checkup. And the big plan is to drop her off and then call Clementine’s (the cockapoo) hair girl to see if she can squeeze her in before Penelope gets home. Because, yeah, you guessed it. She still thinks Clem is a new dog whenever she gets a haircut. Like, she actually growls at her and won’t let her near the food bowls. This has happened every 8 weeks for 2 years now. These are the things you have to think about when you live with a husky. I love any bar that starts with Rice Krispies. I love plain Rice Krispies treats, I love peanut butter Rice Krispies treats, I love them all. So this is kind of a dream come true. It’s the Rice Krispies cereal with melted white chocolate and peanut butter covering them and then marshmallows and mini chocolate chips mixed in. They are delicious and since the only real work you have to do is melting the white chocolate chips, they’re super quick to throw together and then you just have to wait for them to set before cutting them. Maple Bacon Rice Krispies Treats – the perfect sweet and salty treat! Classic rice krispies treats with maple syrup and bacon mixed in. Salted Nut Roll Bars – layers of marshmallow, peanut butter, peanuts, and rice krispies. 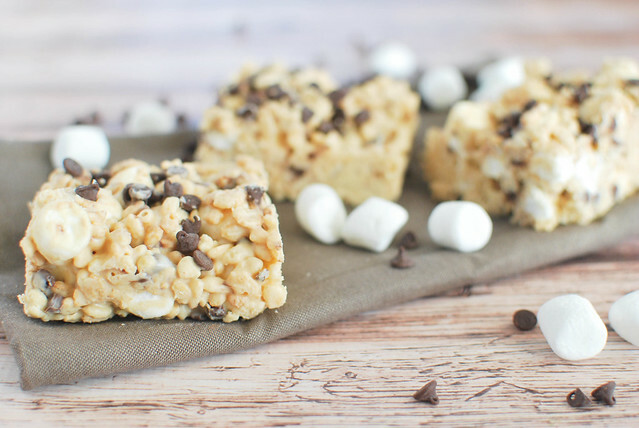 Hot Chocolate Rice Krispies Treats – these taste just like hot cocoa and have mini marshmallow throughout. Melt chocolate chips and peanut butter together over super low heat. Stir constantly until smooth. Put Rice Krispies in a large mixing bowl and pour the white chocolate peanut over it. Stir until all the cereal is coated. Let cool for about 15 minutes, stirring occasionally. Once cool, stir in mini marshmallows and 1/4 cup mini chocolate chips. Transfer the mixture into a 9x9 pan and gently press down to make it all even. Press the remaining 2 tablespoons of mini chocolate chips into the top. Let set completely before cutting and serving. 18 Responses to "Avalanche Bars"
So good. These are the treats I like to munch on! Totally get the growling thing. My Airedale growls at my son when he walks in the door, like he doesn’t know who he is. I blame it on bad eye sight. Great recipe- peanut butter makes everything taste better, well and chocolate of course. Those are all legit concerns when it comes to a husky. my biggest worry is “Ahh man, did I push the bread far enough back on the counter that they dogs won’t get it?” Most of the time the answer is no. womp womp. Your husky sounds like a real trip! Reminds me of the dog we had growing up. Avalanche bars are one of my favorites. I remember my grandma used to sell these along side the pies in her pie shop, so good! Penelope sounds like a sweetheart and I’m thinking she sure keeps things interesting around your house! These bars look incredible. PINNING!! I’ve been wanting to try these kind of bars for a while and these look fabulous! Can’t wait to try them soon! You are not making me want a husky. You ARE making me want Avalanche Bars. Immediately. HAHA!! Oh your husky is so funny! I love all the IG pictures of Penelope. And good luck at the vet! I agree – anything that starts with rice krispies is bound to be a winner! YUM and perfect for game day!! This post made my day, mostly because I live with an IdiotDog myself. Not a husky, but every bit as nutty. Actually I live with 2 of them. Although they do both still recognize my Golden Doodle after a haircut lol. Love these bars–I am a Rice Krispy Treat fiend, so I am excited to try these! 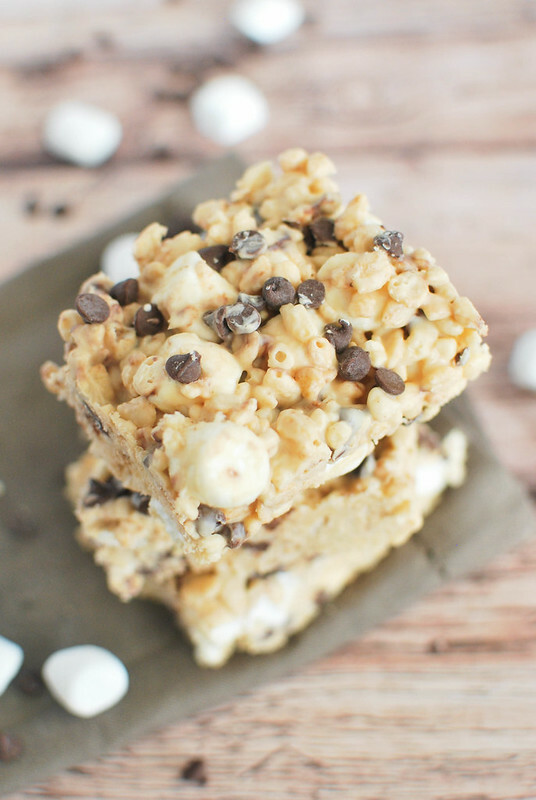 Rice Krispies Treats are my favorites and I bet they taste incredible with peanut butter and chocolate chips. I need to make these soon! That’s crazy, my grandparent’s dog’s name is Penelope! I always thought it was uncommon. But these bars! They look amazing! These look like the perfect little snack!